Physiotherapy is used to maintain or improve physical condition or prevent disorders around it. Physiotherapy starts with evaluation, examination and setting physiotherapeutic goals followed by physiotherapeutic intervention. The physiotherapy methods are chosen individually, taking also patient’s wishes into consideration. This helps to implement the treatment at home too. The sport massage course I studied before physiotherapy education has encouraged me to specialize in manual therapy courses. In musculoskeletal problems, the exercise therapy is especially essential and for that I am willing to give instructions. To analyse or train movement control, I often use the Kinetic Control® concept. I gladly tell about the disorders and their background according to my own knowledge and patient’s interest. OMT (Ortopedic manual therapy) is a popular manual therapy system developed by Freddy Kaltenborn and Olaf Evjenthin. OMT focuses on the examination, treatment and prevention of musculoskeletal disorders. SOMTY arranges also introduction courses for physiotherapists e.g. to improve the manual skills. Joint traction is used to bring decompression to joints and bring some light stretching for soft tissues. Traction can accomplished through hands or belt and is used especially for joint problems. Mulligan -techniques mean mobilization with movement. For example combination of traction and movement bring effective stretching in deeper layer of soft tissues. Mulligan concept is patient friendly and safe because the patient can control the motion. Muscle energy techniques utilize the muscle contraction and relaxation. MET techniques can be used to increase the joint motion and correct joint dislocations in a soft and safe way. MET fits well e.g. to correct position of pelvis. Graston Technique® is soft tissue mobilization using Graston instruments, which are made of stainless steel. In nervous system mobilization the nerve is treated with motion. The method is used to increase the mobility, circulation and metabolism in nerve. Myofascial release is a manual therapy technique which concentrates on the treatment of fascia. Sustained stretching is typically used in this technique. Self myofascial release can be done e.g. with the foam roller. Active Release Techniques (ART) is profound manual therapy technique where the soft tissues are mobilized with movement. ART enables the treatment to be very exact, since each structure is treated with individual motion. LPG is vacuum massage with motorized rolls. LPG is used in the areas of aesthetics, therapy and sports. LPG decreases cellulite, smoothens wrinkles and solidifies the skin. LPG is used to break up adhesions; soften scar; increase circulation, lymph flow, metabolism and the mobility of connective tissue as well as reduce pain. Athletes use LPG for recovery and to release muscle tightness. In shockwave tissues are mechanically stimulated by shockwave machine. The treatment is most useflul in chronic tendinopathies. Rehabilitative ultrasound imaging (RUSI) is carried out using the diagnostic ultrasound system. The most typical area of RUSI in physiotherapy is evaluation and training of muscle recruiment. Kinetic Control is a test and classification system which concentrates on assessment and exercise of movement control. Kinesio Taping is a soft tissue treatment utilizing elastic tape. Most typical use of Kinesio taping is to increase painless joint motion. Kinesio taping is also used to control swelling, restore normal joint function and soften scars. In the most typical technique the tape is applied without or light tension on the stretched muscle. When returning to normal position, the tape makes convolutions and lifts the skin up to bring more space between the skin and muscle. This increases circulation and decreases the stimulus for pain receptors resulting usually in increase of muscle force. Lymphatherapy is a method to reduce swelling. Typically lymphatherapy is used in a situation where swelling has increased because of an injury to the lymphatic system. This can take place in cancer, surgery or radiotherapy. Lymphatherapy is used in musculoskeletal disorders e.g. in the irritation of nervous system, muscle sprain, overtraining injury or after a surgery. Venous insufficiency is a good indication for lymhpatherapy too. Manual lymph drainage and compression bandage are also included to Lymphatherapy treatment. Electrotherapy and thermal therapy are classic physiotherapy treatment tools together with manual therapy. Cold treatment is typically used after acute injury to control pain and metabolism. Heat treatments (heat pad and ultrasound) are used after acute stage to increase metabolism, control pain and increase the flexibility of collagen, which is the main structure of connective tissue. Heat therapy can be used as a pre-treatment for massage and mobilization. Goals of electrotherapy (e.g. DIDY) are to control the pain and reduce the inflammation and swelling. 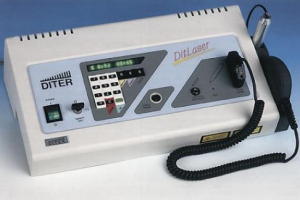 In laser therapy the laser beam is used e.g. to speed up healing process and reduce pain. I own the spine distraction device too, which is possible to rent for home use. Distraction relaxes muscles and cure joints. Distraction increases hydration of the intervertebral disks and joint cartilage making them stronger. The distraction device can be used in the treatment of knee- or hip arthritis. Contraindications are severe rheumatoid arthritis, osteoporosis, high blood pressure or heart failure.